I think we can all agree that our children’s safety on a daily basis ranks as being pretty darn important! 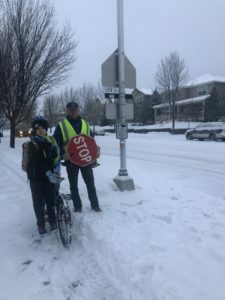 Which is why, today, we’re excited to introduce you to Ron Steele – a very important man who keeps our kids safe every morning and every afternoon at the intersection of Sylvan Lake Road and Eagle Ranch Road! Ron has been a volunteer crossing guard for the past four years at this location. The reason why he started volunteering just illustrates further Ron’s genuine concern for our community and the children who walk or ride bikes across the intersection each morning and afternoon. “I’d always seen a female police officer at that crosswalk when I’d drive by, but then one day she was not there,” shared Ron. So, Ron headed to the police station to inquire. He was told that the officer had moved out of state and that no one was currently serving as a crossing guard there any longer. Ron didn’t’ want that to be the case! “That intersection seems to be getting busier and busier, especially in the mornings. It just didn’t seem right that those kids didn’t have a crossing guard there to help keep them safe,” shared Ron. After a lengthy background check, fingerprinting and some mentoring by a local officer, Ron officially became the crossing guard at Sylvan Lake Road and Eagle Ranch Road, and we’re so lucky to have him. Prior to moving to Eagle, Ron and his wife, Sheila, lived preliminary in Indianapolis, Indiana, but also had a condo in Beaver Creek. Once they retired, they knew they wanted to call Eagle their home full-time. They enjoyed their time in Beaver Creek, but loved the small town feel of Eagle. So, they purchased a home in 2012 and have been full-time residents since 2015. Ron also volunteers on the Volunteer Police Committee in Eagle. Ron, from the bottom of our hearts, we want to thank you for volunteering your time to ensure our kids are safe! Thank you so much for what you do!